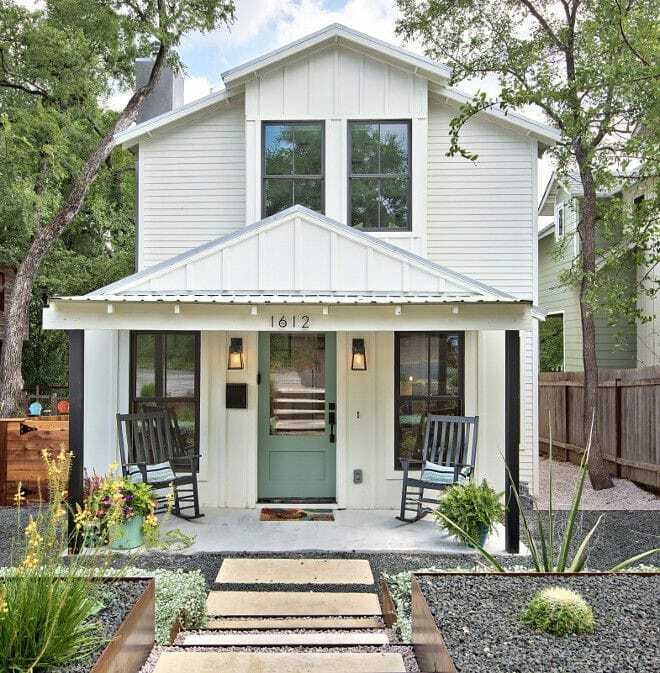 A collection of the best exterior white paint colors that work well to achieve the modern farmhouse and coastal home vibe. 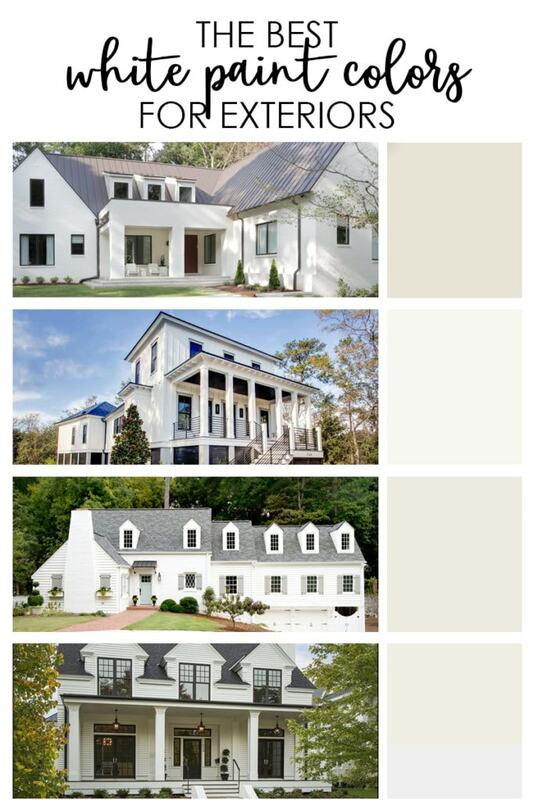 Real-life examples are shown to demonstrate each of these warm white paint colors that work well on exteriors! A week or two back, I mentioned we’re finally at the point to have our exterior house painted. From the day we moved in over five years ago, I knew I’d eventually want to have things lightened up a bit. So, for the past few weeks I’ve been researching white paint colors that work well in an outdoor setting. We wanted something a bit warmer to ensure we aren’t completely blinded by the new look. 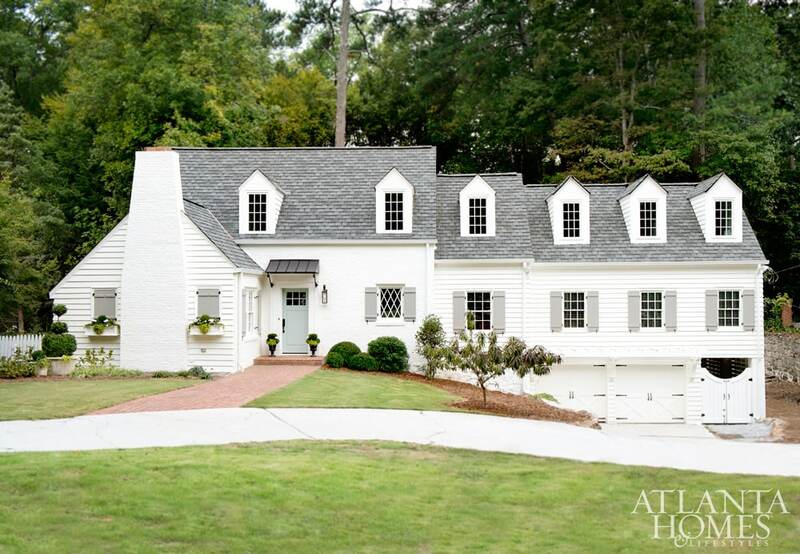 Today I’m sharing the best exterior white paint colors! Last year, I shared some white houses with black window trim inspiration. Although our window trim will be more of a bronze color (we’re leaving the existing color), the post helped guide me to figure out the overall look I wanted. However, at the time, I hadn’t actually looked at which colors any of the inspiration photos were. I know picking exterior paint is a totally different art form than picking interior paint! So, I asked my Instagram followers for advice and got so many great recommendations! As the color recommendations poured in, I immediately did Google searches on each of the colors to find images to represent each option. I then did some additional research to hear what many pros said. 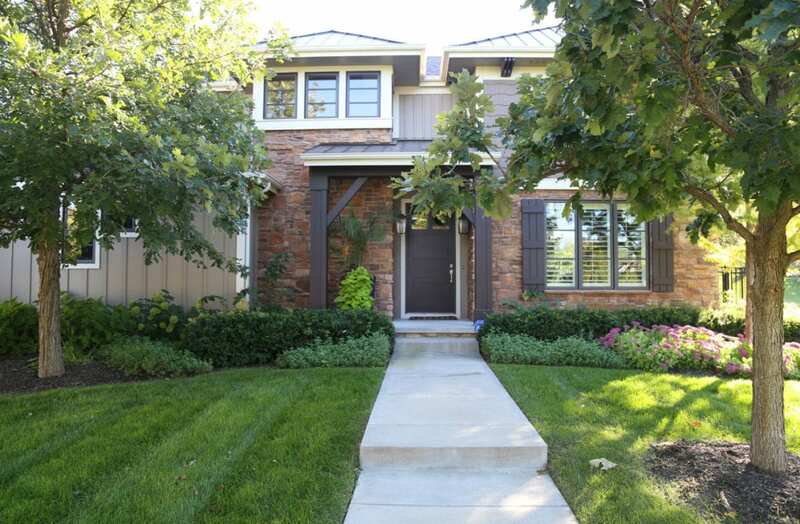 Surprisingly, it is very hard to find reliable exterior paint color photos. 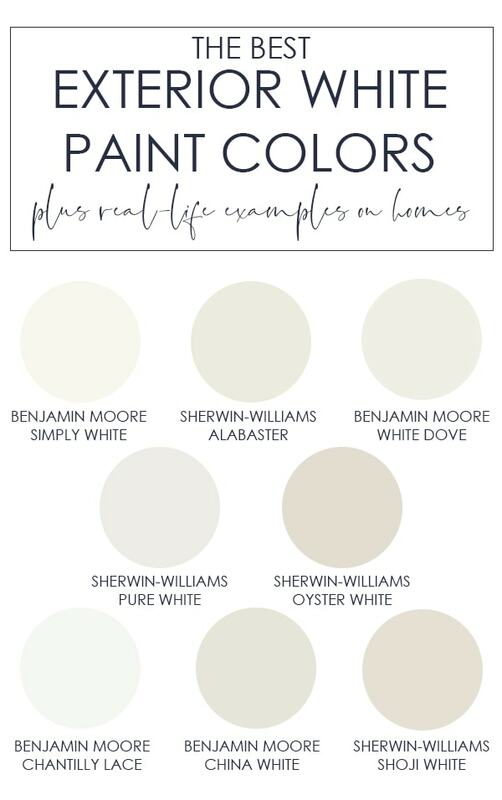 Today I’m sharing all of the great ideas with each of you along with real-life inspiration photos of the white exterior paint colors recommended! Be sure to also check out my post on the best white paint colors for interiors for even more inspiration and color ideas! Benjamin Moore Simply White has long been a favorite of mine for interiors, but I wasn’t sure how it would translate on exteriors. Turns out it looks amazing there as well! 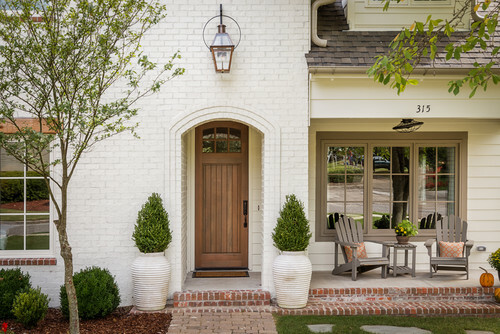 The front door color in the image below is Benjamin Moore Azores which pairs perfectly with the modern farmhouse vibe! Sherwin Williams Alabaster was one of the most recommended colors by my Instagram followers. Many have used it on their house and each and every person loved it! Benjamin Moore White Dove is a favorite for kitchen cabinets, but it also ranks high for exterior white paint! It has a hint of gray in it, making it slightly cooler than some of the other white paint options. Update: This is the color we chose! 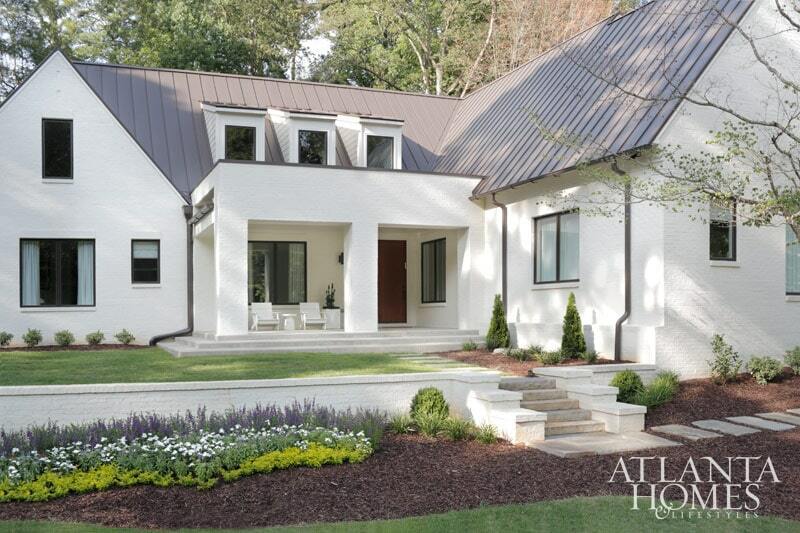 Be sure to check out our Benjamin Moore White Dove Exterior House Reveal! It’s full of even more photos and reason why we went with this color! This is a warm white that looks beautiful on painted brick or with brown accents on the exterior of your home. 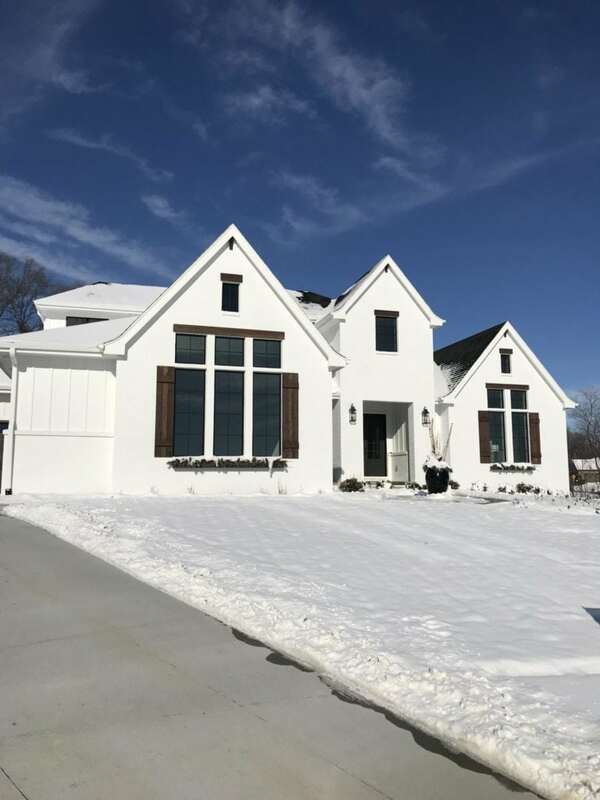 This bright white painted brick and board and batten paired with black window trim and walnut wood accents look beautiful even against freshly fallen snow! Benjamin Moore Chantilly Lace is perhaps the “whitest” of the options, and works well with the modern farmhouse vibe! Another warm white option, Benjamin Moore China White pairs well with brown and bronze accents! Sherwin Williams Shoji White is probably the warmest and most saturated of the options. Our friends Jill and Nick actually have this color on the interior of their home and it’s gorgeous. 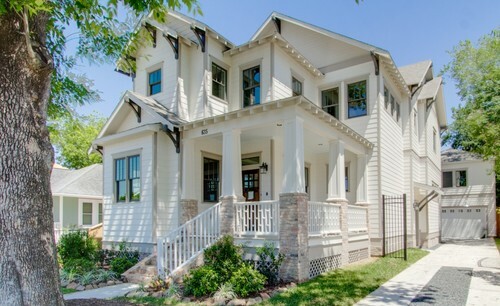 But many of you said it’s equally as beautiful on home exteriors! As mentioned, it was really hard to find images of some of these colors and/or I could only find “best guesses”. But here are some additional paint options that made the best exterior white paint colors list! As a reminder, here is how our house currently looks. Because of the two sections of shaker shingles, I’m wondering if I should really do everything white, or paint the shaker shingles a slightly darker color. I’m think a soft warm beige color. I’d love to hear your thoughts on this as well! Our new roof and gutters should be getting installed within the next week or two, and I opted to take both darker in preparation for the new paint colors. So, the roof will be a dark brown/gray color and the gutters will match our window trim and be more of a bronze color. For the time being, the stone will be remaining as is, although I’d eventually love to have it painted or replaced. Update: See how our white painted house turned out here! And another shot without the leaves on the trees so you can see the shaker shingle areas better. Thank you to each of you that took the time to send me your recommendations! And for those that don’t follow me on Instagram or didn’t see the original post, feel free to offer more suggestions for the best exterior white paint colors in the comments. I can then update this post accordingly so that it can continue to be a source of inspiration! 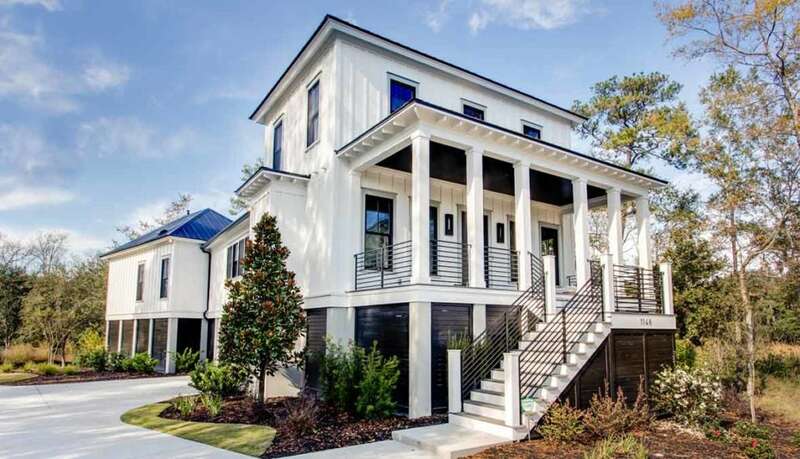 Sounds beautiful….Just curious if you paint your house white wouldn’t you have white gutters!! Do you want your gutters to stain out against the White House?? With the stone remaining I think you need your white to be one of the warmer white options. And since you already have stone color and texture, roof showing, and some other variations in texture, I would do as much as possible in the same warm white. You have enough going on to add interest. I love the inspiration pics, any one of them would be beautiful! You might want to consider how the back of your house would look in a lighter, whiter color. We have lots of white pavers and acrylic pool decking down here in Florida, and very few white houses. They look beautiful in pictures but in actuality, it’s almost TOO much white with the sun bouncing all around. Obviously every back yard (and state) is different. Just a thought! White Heron is a color I’ve used before and it’s great in the right setting. In my experience it tends to go gray which might not be the look you’re going for, especially in Omaha where I know that winter days can be rather gray as well. I would paint all the non-stone areas the same white color to unify all the siding materials. I think it would look busy otherwise since you have so much going on already. Its a lovely home and I think whatever you do will be brilliant. I think staying with the warmer whites would be your best option. The Oyster white and the Shojo white would look fantastic with your bronze windows and gutters and your new roof. The brighter whites might just be off. Good luck with your designs. Hi Sarah, have you tried the color snap visualizer on the Sherwin williams website? You download a picture of your hm. & can pick paint colors & paint the house or rm. We did this when we painted our house a few yrs ago & it really helped a lot. I too would leave the main of the house one color with with the stone. I have in the past painted the downspouts of the house the house color, leaving the others the color of the roof. I agree Gutters are not something to be featured unless nice copper ones. They will stand out on a white house. Another color that people often skip over is BM Classic Gray. Very neutral. I had it on all my trim with a full brick rancher. It blended well without being stark. It is on my walls in my new house. Nice neutral. Love your suggestions on exterior whites. I have a small acadian style home, faces due east, that is very dark in the front. Current stucco is dark, drab looking. The front is stucco with brick, siding in the rear. Anyhow, I like this picture of the SW Oyster White with brown trim. 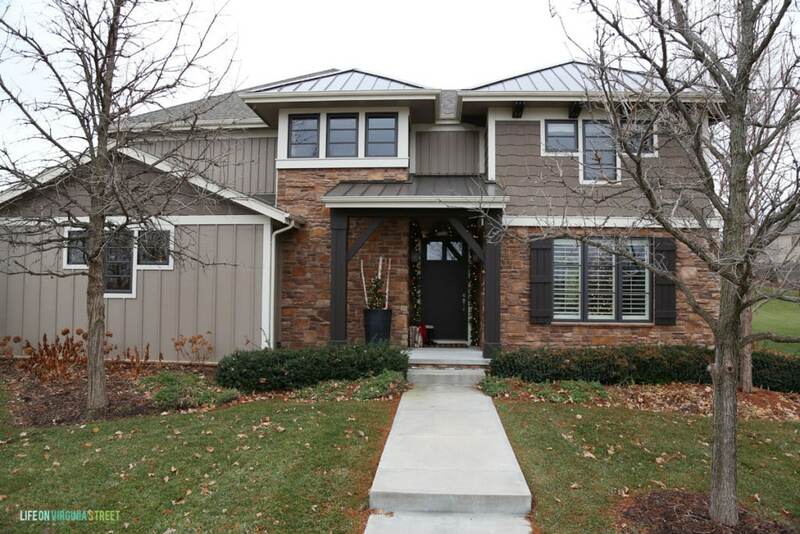 Do you happen to know the color of the brown window trim in this picture? Thank you! And that color is Equestrian Gray by Benjamin Moore.